I’ve decided to have an occasional round-up of crime fiction that I’ve enjoyed and I’m featuring three novels today. I came across a review of The Mangle Street Murders by M. R. C. Kasasian on one of my favourite blogs – http://clothesinbooks.blogspot.co.uk/2014/03/the-mangle-street-murders-by-mrc – and thought it sounded worth a look. I thoroughly enjoyed it. It is set in the late nineteenth century. Sidney Grice, a ‘personal detective’ as he styles himself, is a kind of anti-Sherlock Holmes. Whereas I imagine Holmes to be rather attractive in a saturnine way, Grice has a glass eye which he keeps taking out and a repellently supercilious manner. However March Middleton, the young woman who goes to live with him as his ward and becomes his assistant, is more than a match for him and the play of wits between the two is great fun. The story moves along at a cracking pace. There are plenty of jokes (Conan Doyle makes an appearance at one point) and although I guessed some of the solution to the mystery, it really didn’t matter. My second novel is Asa Larrson’s The Second Deadly Sin. She is maybe my favourite Scandanavian writer and I wasn’t disappointed. She is so good at really gripping openings. A bear attacks a dog outside a farm house and is shot and wounded by the farmer. The bear is hunted down and killed: in its stomach is a human hand. Meanwhile in a nearby town a woman is murdered and District Prosecutor Rebecka Martinsson and Police Officer Anna-Maria Meller get to work on the case. They are both attractive characters. The story is a complex one with its roots in the past and if there was a weakness it was in the flashbacks to a hundred years before. I wasn’t quite convinced by them and found myself wanting to get back to the main story. But still, a very good read leading to a tense climax. 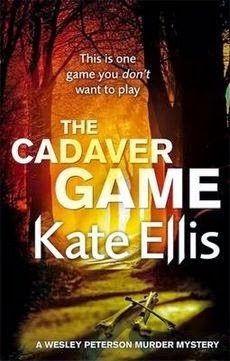 Kate Ellis in The Cadaver Game (great title!) also makes use of connections between the present and the past, and does so very skilfully, using journal entries from a couple of centries earlier. This too has an arresting opening. Two young people run naked through woods at night, paid to take part in a game which turns out to be anything but. It is some time before their bodies are found and meanwhile the police, alerted by an anonymous phone call, find the body of a woman in a cottage. This is the sixteenth outing in a very successful series featuring DI Wesley Peterson. A complex plot is well handled, the ending was clever, and I loved the enticing Devon setting. So three novels I can happily recommend if you are looking for some holiday reading. Kate’s new novel, The Shroud Maker, is just out in paperback and I have asked her to be my guest on the blog soon, so something to look forward to. Incidentally I’d love suggestions for my own holiday reading. Something with a French flavour would be particularly welcome. How nice – thanks for the shoutout! And since we shared the taste for one (and in fact seem to have an awful lot of shared reading) I will take your recommendation for the others…. Thanks, Moira. Hope you enjoy them: it’s quite a responsibility! The Asa Larrson is wedged somewhere in book pile 300 — I think. You’ve encouraged me to release it from it’s prison and make it book number 3 in my simultaneous readings. I do have a “third eye,” and it’s good to make use of it occasionally. ‘0) The Cadaver Game will be coming soon. Thanks for your trusted suggestions.